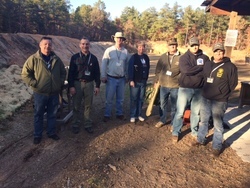 We are a Moore County Wildlife and Conservation Club focused on the education of our Members and Youth in fire arms safety as well as in the preservation of our fields, forest, fish and wildlife. Today, we strive to provide a safe environment for the education of our youth and in the preservation of man's gift from God, our field and forests, our fish and wildlife, and our freedom to go afield with rod or gun to enjoy the great outdoors. We extend the safe environment for all our members, their family as well as their friends to experience the gift of our natural surrounding. Through the efforts of our members the nature trails are here for all people interested in the environment, preservation of forests, lakes, streams, and threatened wildlife. We hope you will visit our facilities and consider joining our family. The "Calendar of Events" will identify our monthly meeting where you can get to know us. To be fully informed of all Club's activities, remember to check the "Calendar of Events". Members use our nature trail, picnic and barbecue area, and a lake for fishing that is surrounded by pristine woods. Find out more about our rifle, pistol, trap range and indoor air rifle ranges. 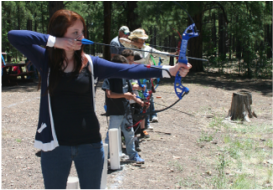 Interested in archery? Learn more here.